← Wait — Not Another Apple Podcast?! 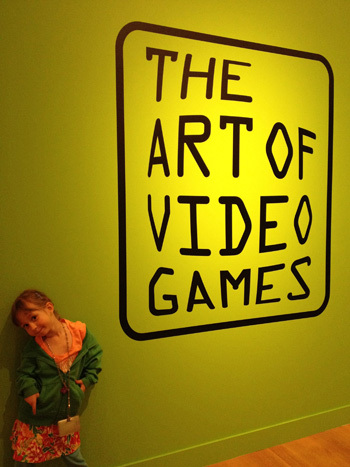 This past weekend, my daughter and I attended an exhibit at the Smithsonian American Art Museum in Washington, D.C. that no gamer or pixel artist in the region will want to miss. The Art of Video Games exlores the 40 year evolution of video games as an artistic medium. Curated by Chris Melissinos, former chief evangelist and “chief gaming officer” for Sun Microsystems and founder of PastPixels, the exhibit features wall-size projected medlies of video games in action, big-screen, hands-on gameplay stations, quips and quotes from gaming greats of years past, and displays featuring many major game consoles ranging back to the Atari 2600, and corresponding selections of game titles that play on them. The exhibit is located on the third floor of the museum and is spread across three large rooms, each with a different focus. The largest area of the exhibit is a dark space with a selection of games projected on the walls in front of controller stations where visitors can take turns playing. The playable displays include PAC-MAN, Super Mario Bros., MYST, The Secret of Monkey Island, and Flower. The exhibit runs from March 16th to September 30th at the American Art Museum and, from there, it will go on a 10 city tour across the country. As a special feature for the opening weekend, the three-day GameFest gaming festival was being held during our visit. GameFest featured talks by industry veterans including Nolan Bushnell, various discussion panels, additional hands-on game stations, and even real-life, in-the-flesh “video” games in which visitors could participate. Some of the GameFest-ivities can be seen towards the end (in the outdoor courtyard) of the video I captured during my visit to the exhibit. A companion book has been published to accompany the exhibit. The Art of Video Games: From Pac-Man to Mass Effect is written by curator Chris Melissinos and features a foreword by director of the Smithsonian American Art Museum Elizabeth Broun and an introduction by Mike Mika, head of development for Other Ocean Interactive and an advocate for the preservation of video game history. The book features over 100 composite images of video games and retails for $40 (though it can be had for much less at a certain, massive online bookstore). Whether during the initial D.C. run, or on the 10-city tour, check this one out, if you’re able. Photos of the exhibit can be seen in the event’s Flickr group and in my own photo set. This entry was posted in Gaming and tagged 8-bit, arcade, graphics, pixelart, retro, vintage. Bookmark the permalink. This does indeed sound amazing. Wish I could visit the thing, but -let’s face it- it’s not very likely. Anyway. Excellent post. Thanks! … and I hope this exhibit tours to NYC.